As Internet addiction increases in many countries, new forms of treatment are being developed. Photo by Flickr user Marc oh! In Daxing, a suburb outside of Beijing, an addiction treatment center is guarded by walls topped with barbed wire. Its young patients live in guarded cells, given medication, participate in therapy and adhere to a strict physical and dietary regimen. If the ailment seems like a joke, you probably haven’t seen the inside of the Chinese rehab centers committed to “deprogramming” patients of what Chinese psychologists call a clinical disorder. In a new New York Times Op-Doc video “China’s Web Junkies,” filmmakers Hilla Medalia and Shosh Shlam explore the inner workings of one such center where teenagers are brought, usually by their parents, to be treated for three to four months. 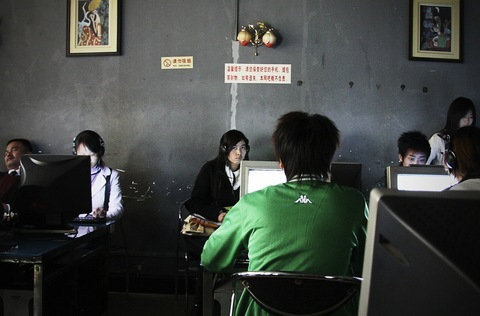 Internet addiction in China has been tied to the increasing number of cybercafes, where young adults go to play games for hours on end. In the film, a patient brags about spending three uninterrupted days playing at a cafe. “It felt good,” he says grinning at the camera. At first, Medalia and Shlam depict the treatment center as incredibly harsh (within the first minute, a young man is shown sobbing after handing the cameraman a letter for his mother). But as the narrative progresses, the rationale behind the treatment surfaces. Addiction to online gaming in Asia has become rampant. In 2010, online games were South Korea’s largest cultural export item, worth $1.5 billion. High-speed Internet connections in over 90 percent of South Korean households and popular cybercafes have fostered addiction for 936,000 South Korean youth, the New York Times reported in 2010. Though statistics by country are scarce, both western and Asian media have reported extreme cases of Internet addiction. “Love Child,” a 2014 film by Valerie Veatch and a joint Korean and U.S. production team, documents the story of a couple that met online and raised a virtual baby together, but were later charged with the negligent homicide of their real-life three-month-old daughter, who died of malnutrition. The South Korean government claims that counseling programs have lowered the number of teenage addicts. In China, attempts to curtail Internet addiction have led to strict camps like the one depicted in “China’s Web Junkies.” At other Chinese locations, electroshock therapy has led to the deaths of several teenagers but has since been banned as a treatment for online addiction. Treatment for Internet addiction is now available in the U.S. Last September, the country’s first inpatient treatment program for Internet addiction opened in Pennsylvania. The program features 10-day treatments beginning with a two-day “digital detox” and a full psychological evaluation. At the Daxing center in China, patients’ rehabilitation is heavily regimented but in a counseling session with patient’s parents, a therapist asks parents to be more understanding. “One of the biggest issues among these kids is loneliness,” he says in a therapy session for parents. “China’s Web Junkies” is an excerpt of Medalia and Shlam’s feature-length documentary “Web Junkie.” It premiered Sunday at the 2014 Sundance Film Festival. Editor’s note: In an earlier version of this post, the documentary “Love Child” was attributed as a 2010 film. The post has been corrected to reflect that the film is being released in 2014, with its world premiere at the 2014 Sundance Film Festival in Park City, Utah.